Most of my first London is here, part of the living landscape, easily recognisable, and, in reality, pretty much as it was in the pictures. Much of the second remains too. As Ed Glinert writes in his book Literary London, “There is little of London that isn’t Dickensian, so intensely did the author walk its streets and use both its major landmarks and its more obscure sites in his stories”. However, hidden behind the overlays of time and progress, the Dickensian London is harder to find and demands more of the imagination. 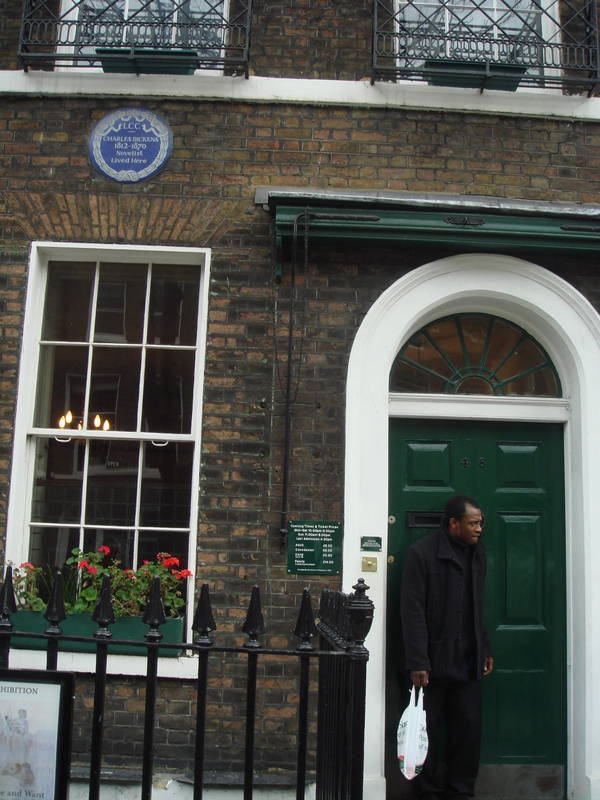 So, armed with Literary London and following Glinert’s guided walk, “From Dickens’ House to Fagan’s Den” I set off to uncover it. The walk is a rough triangle. It leads out along Holborn’s Theobald Road, a roaring traffic clogged, concrete bounded thoroughfare, into Oliver Twist territory, first to Hatton Garden, site of Fang’s “very notorious Metropolitain Police Station’ then to Saffron Hill, locale of Bill Sykes Three Cripples pub. It continues along Clerkenwall Green, scene of Oliver Twist’s arrest, then turns into Goswell Road where Mr Pickwick lived. It passes the 21st century village of Barbican and follows Aldergate Street, which sits like an urban gorge at the bottom of cliffs of glass and steel and where, at the long-gone Albion Hotel, Dickens celebrated the completion of Nicholas Nickleby. At Cheapside, where abseiling builders crawl like flies up the side of a fat, round tower and where Mr Jaggers meets Pip in Great Expectations, it turns again. Leading back along Newgate Street, past the site of the infamous Newgate Prison, where Fagin is excecuted, Barnaby Rudge imprisoned and Magwitch of Great Expectations dies, it crosses the Holborn Viaduct, above the site of Fagin’s den. It passes the 16th century Staple Inn, described in Edwin Drood and still standing, Chancery Lane, the setting for Bleak House and Gray’s Inn where Dickens worked as a solicitor’s clerk. Here, back at Theobald Road, the triangle closes but the walk continues, over to Great Ormond Street past the Childrens’ Hospital where little Johnny dies in Our Mutual Friend. 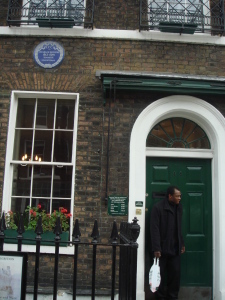 It finishes at Doughty Street, at the Charles Dickens House and Museum. This was a long day’s walk, punctuated by many breaks and deviations. It was thought-provoking, rather moving journey too. It was trip down memory lane, back to the world of Oliver Twist, Mr Pickwick, Pip, Barnaby Rudge and Dickens himself. It gave a scope and a context to my Dickensian London. In reality though, there is little left of Dickens’ London, just a few fragmented glimpses, some plaques and a lot of lingering ghosts among the distractions of towering glass and concrete, the roaring traffic and the constrained grey city suits. London, as Dickens knew and drew it, is long gone, buried with the Victorian world from which it was born. And a good thing too, many would say, probably even Mr Dickens himself. But still, I for one, will always be grateful for and stand in awe of the sensitive soul, the keen eye and the brilliant pen, that wove that London into so many unforgettable stories and gave it life in our imaginations. I’m grateful, too, to Mr Glinert for tracing these places from the stories and setting them down in a path for others to follow. for this particular information on-line for sometime now therefore appreciate it. I do write in my journal everyday. I’d like to start a blog so I can share my own experience and thoughts online. Your style is unique compared to other folks I’ve read stuff from. Thank you for posting when you’ve got the opportunity, Guess I’ll just book mark this web site. Thanks! I really like your site too! May I just say what a relief to discover somebody who genuinely understands what they’re talking about on the net. You certainly understand how to bring an issue to light and make it important. More and more people have to read this and understand this side of the story. I was surprised you aren’t more popular since you definitely possess the gift. Great info. Lucky me I recently found your website by accident (stumbleupon). I have bookmarked it for later!